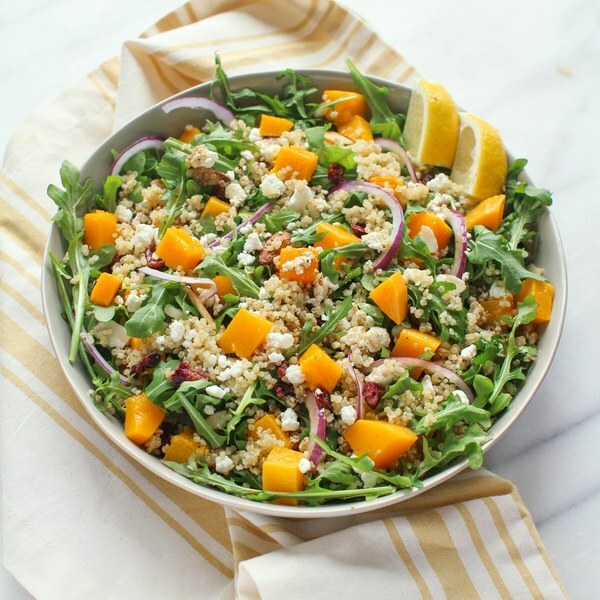 ← Arugula, Butternut Squash & Quinoa Salad with Goat Cheese. Peel squash, scrape out and discard the seeds, and medium dice the flesh. Transfer to a sheet pan. Drizzle squash with oil and season with salt and pepper. Toss to coat. Place in the oven and roast until squash is tender, 10-15 minutes. Wash and dry arugula. Transfer to a large bowl. Peel and thinly slice onion into half rings. Add to bowl. In a small bowl, prepare dressing by whisking together lemon juice, oil, vinegar, salt, and pepper. Cut remaining ½ lemon into wedges. Crumble goat cheese into a small bowl. Uncover quinoa and fluff with a fork. Add quinoa and squash to salad and toss. To serve, place salad on a plate, sprinkle with goat cheese, and drizzle with dressing. Enjoy!